First sold in 75 cl (25.4 fl.oz.) bottles, it is noted for its copper color and as the first beer brewed by the monks of Chimay in 1862. Its taste, which imparts a silky sensation to the tongue, is made refreshing by a light touch of bitterness. To the palate, the taster perceives a pleasant astringency which complements the flavor qualities of this beer very harmoniously. 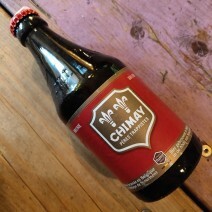 This top-fermented Trappist beer, re fermented in the bottle, is not pasteurized.